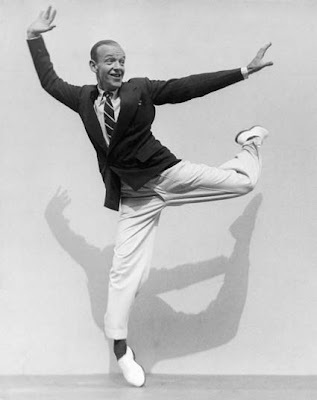 With the reissue of two 'indispensable' books on Fred Astaire, Alastair Macaulay took the occasion today in The New York Times to ask the question, "How should we react to 'Bojangles of Harlem,' the extended solo in the 1936 film 'Swing Time' in which Fred Astaire...wears blackface to evoke the African-American dancer Bill Robinson." Mr. Macaulay immediately comments on his own question that, "No pat answer occurs." The two books are "The Fred Astaire and Ginger Rogers Book" by Arelene Croce and "Astaire Dancing: The Musical Films" by John Mueller. The latter, Mr. Macaulay calls, "...the most definitive. Surveying all of the 31 of Astaire's dance films...it is a model of scrutiny and research."